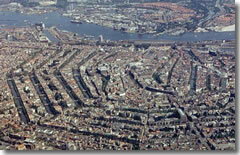 An aerial view of Amsterdam. (Photo courtesy of the Amsterdam Municipal Department for the Preservation and Restoration of Historic Buildings and Sites (bMA)) Amsterdam, like Venice, is a city infiltrated by water. On a map, it looks kind of like a spiderweb (or a fingerprint), with the canals as the threads radiating out from the center in tight, concentric arcs. You don't really think about addresses or directions in terms of streets here, but rather in terms of where things are located in relationship to the canals and to six major squares. Dam Square, Amsterdam.There are just a very few street names you'll want to keep in your head, starting with the Damrak. Think of the Damrak as the backbone of the City Center. It runs from the Centraal Station train station at the north end of town straight down to Dam Square, the heart of the city and where the first dam across the Amstel River was built (hence the name Amstelledamme, later to become Amsterdam). 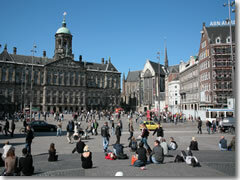 Out the other end of Dam Square, the main street changes names to Rokin, which curves down to the square and transportation hub of Muntplein. East of Muntplein, on the City Center's southeast corner, is Waterlooplein, home to one of the city's premier music halls and a flea market. Southwest of Muntplein, on the other side of the Canal Zone, lies Leidseplein, the bustling, throbbing center of Amsterdam's liveliest quarter of restaurants, nightclubs, and theaters. Farther south is Museumplein, ground zero for art lovers and museum hounds (the Rijksmuseum, Van Gogh Museum, and Stedelijk Modern Art museums all lie between Museumplein and the parallel Paulus Potterstraat). Three blocks to the north of Museumplein is P. C. Hoofstraat, Amsterdam's most fashionable shopping drag. The City Center consists of a few straight canals and a tangle of medieval streets. It's bounded by the arc of the Singel Canal/Amstel River/Oude Schans canal and runs from the Centraal Station south to Muntplein, with Dam Square in the middle (this is where you'll find the Red Light District). The Canal Zone is next, wrapped around the City Center in a big arc. It's made up of a series of six concentric canals that are laid out with 17th-century regularity. The irregular canal Singelgracht bounds this neighborhood. To the south lies, again, The Museumplein, where you'll find the city's greatest museums of art, finest shopping, and some of the best small hotels. Further south is Amsterdam South, the most upscale residential district (of great interest to upwardly mobile Amsterdammers, but not to visitors). The Jordaan, a grid of small streets slung between two canals at the northeastern end of the Canal Zone, is an increasingly fashionable neighborhood with several good restaurants. Amsterdam East, east of the City Center, is the fairly pleasant and residential working-class and immigrant neighborhood, with attractions like the zoo and tropical museum.